"Who knows? What do you fancy you know? What do you really know? Student: Are 'the one who knows' and 'original mind' the same? Ajahn Chah: No no. the one who knows is something that can change. It is our awareness…Everyone has this. S: So not everyone has original mind? AC: The original mind is in every person. Everyone has the one who knows. But the one who knows is something you can never reach conclusion with. Original mind exists in everyone, but not everyone can see it. S: Is the one who knows a self? AC: It isn't - it's only an awareness arising. Questioning like this only leads to endless conclusion. You won't come to clear knowledge just from hearing another's words. Thinking that if you have the right questions about all the fine details you can find out the truth is not how it works. It is really something to be realized for yourself. But take the words and investigate what they point to." I know nothing about advaita and so therefore I like to ask: are the phenomena-tool-language to be corrected in order my clinging can understand it? Or is it my clinging itself which divides tools in correct and not? When habitual clinging is not available, should not clarity reveal what we call by language "reality"? Astus: "The difference in brief. Those who believe there is an actor behind action think there is a self/soul. Those who realise that the mind is empty, without a self, understand that it is buddha-nature." As percieved appearances does not 'exist' because of having no essence of their own, which is distinct from the perciever who also has no essence of its own... the danger is that nihilism can strand in nothingness. That must be why we need an awaken Master. Ramana has said ( I paraphrase) that we are not striving to reach a goal, we are already there; we have just got to get rid of the illusions that cloud our minds and then get rid of the mind. S.S. Cohen quotes the Maharshi as saying, "Yes, the Guru does not bring about realization, but simply removes the obstacles to it. The remembrance of an object is coupled with a rememberance of the experience, the previous cognition of the object. In other words, when someone remembers an object, the object alone is not just brought to mind, but gets tagged with the "trait" as "having been experienced in the past." This aspect of memory relates to an awareness of awareness of an object. One would usually call such "self-awareness," but this is, of course, a designation that Buddhism considers false. Buddhism does hold that each particular cognition of an object has its own temporary cognition of cognition, or "self"-luminosity of each experience, with the "self" here meaning only that episode of perceptual experience or memory, not an enduring self. In other words, Buddhism holds that one fleeting episode of awareness can include awareness of awareness. However, the Shaivas argue that this Buddhist theory does not account for the cross-episodic awareness aspect of memory (124). As described earlier, the experience of remembering includes an awareness of not only of similarity between the present object and a previously experienced object. Remembering also includes an awareness of having a previously experienced the object. "This is that," the object designated as that is qualifed as being experienced before. Now how could this present temporary fleeting unique episode of remembering awareness have an awareness of previously experiencing something? If the previous episode is a unique particular awareness, and the remembering episode is a unique particular awareness, then the remembering episode could not be qualified as previously experiencing anything. Each cognitive episode, according to Buddhism, is distinct and unique, and no number of episodes have any authentic connection or unity amongst them. If this were true, how could one episode, all by itself, have the ability recall or connect itself to a previous episode in memory? Yet one knows and Buddhism does not deny that such occurs. Thus The Shaiva asserts that the Buddhist theory of cognition cannot account for previous awarenesses of awareness. The Shaiva response is finally that there must be a continuing enduring self that is involved with awareness of previous awarnesses (125). An enduring self can of course be aware of its own, united, collection of awarenesses across time. Reaching the highest chakra is akin to non duality, it's basically the path of kundalini shakti, but it's really the pathless path and can't easily be contained or esplained. A devotee of Ramakrishna upon seeing Ramana Maaharshi wrote: "When doubts arise in the mind our intellects are quickened, such literature is helpful in dispelling them. In other words, the Advaitin speaks only to dispel a doubt that might have arisen in himself or in another. Ramana remains faithful to this idea. He is mostly silent, and speaks but a little if questioned on any point. Of course he jokes and speaks occasionally on other things, but he has no dogmatic teaching on Vedanta to deliver. He told me he says ‘yes, yes’ to everyone who interprets Advaita, even to some of his followers who interpret his ideas in the books published under his name. When I asked, regarding a book that I purchased in the depot there, how far the ideas stated therein are his teachings, he told that it is very difficult to say that, as he had no definite teaching. As people have understood they have written, and they may be right from certain points of view. He himself, he said, has absolutely no idea or inclination to write a book; but due to the entreaties of some people about him he has written some verses, and he told me that he is often troubled by men who take a fancy to translate them into this language and that, and ask him about the faithfulness of the translation. So mostly the Maharshi remains silent, and people come, make prostrations, sit before him for some minutes to hours and then go away, perhaps without exchanging even a single word!" I think the key words are he has no dogmatic teaching to deliver. Maybe i'm missing something but this is all pretty well covered by the Twelve Links, or just a decent intuitive understanding of dependent origination..
"Each cognitive episode, according to Buddhism, is distinct and unique, and no number of episodes have any authentic connection or unity amongst them"
I don't understand quite what they are getting at here, I assume they are trying to demonstrate some kind of abiding self with this model, but it seems pretty poor to me, as in the above "unity" is poorly defined as regards the memory example, and saying there is no connection is actually very incorrect in light of dependent origination - there is a connection between everything that has ever been or will be since beginning less time, there just isn't some unchanging thing that stays the same in the process, things are eternal in their non-eternality as it's said. Again maybe i'm missing something, there is alot there, and I should probably re read it but it looks like a big, fat, straw man to me...what they are saying Buddhist say is not really what they say. I suspect it will come down to the same old thing..whatever unity they claim exists due to awareness of awareness needs to be demonstrated before it can be ascertained as a "self" or anything else, they seem to just be saying "because there is awareness of awareness, there must be a self"...again unless i'm missing something, can you explain it better? johnny, Can we take what we see and hear fresh, undefined with surprising possibilities, as if for the first time? Johnny Dangerous wrote: Again maybe i'm missing something, there is alot there, and I should probably re read it but it looks like a big, fat, straw man to me...what they are saying Buddhist say is not really what they say. I suspect it will come down to the same old thing..whatever unity they claim exists due to awareness of awareness needs to be demonstrated before it can be ascertained as a "self" or anything else, they seem to just be saying "because there is awareness of awareness, there must be a self"...again unless i'm missing something, can you explain it better? Somānanda briefly adduces some considerations against the Buddhist theory of momentariness, which were directly picked up and elaborated by Utpaladeva and Abhinavagupta. The most important of these was his advertence to the experience of recognition (pratyabhijnā) as evidence both for the continuity of entities from the past through the present, and for the self that connects the past and present experiences of those entities. It was originally the Nyāya-Vaisheshika school that adduced such considerations against the Buddhists, and the ninth-century Shaiva Siddhānta thinker Sadyojyoti in his Nareshvaraparīkshā had also recently employed these arguments. Somānanda introduced them to monistic Shaiva philosophical reflection with great future consequences. The Pratyabhijnā philosophers’ response to the problematic posed by Buddhist logic revolutionized earlier approaches of the Nyaya philosophers, the Shaiva Siddhāntin Sadyojyoti and even Utpaladeva’s teacher Somānanda, and may be characterized as a form of transcendental argumentation. Utpaladeva and Abhinavagupta interpret their central myth of Shiva’s emanation and control of the universe through Shakti as itself an act of self-recognition (ahampratyavamarsha, pratyabhijnā). Furthermore, abjuring Somānanda’s agonistic stance towards Bhartrihari, they also equate Shiva’s self-recognition (Shakti) with the principle of Supreme Speech (parāvāk), which they derive from the Grammarian. They thereby appropriate the Grammarian’s explanation of creation as linguistic in nature. Thus the Kashmiri Shaiva philosophers ascribe to Speech a primordial status, denied by the Buddhist logicians. Vimarsha and its cognates have the significance of apprehension or judgment with a recognitive structure, and may be glossed as “recognitive apprehension.” (The recognitive is the act of recognizing or an awareness that something perceived has been perceived before.) Utpaladeva’s and Abhinavagupta’s arguments centering on these terms develop earlier considerations of Bhartrihari on the linguistic nature of experience. Utpaladeva and Abhinavagupta refute the Buddhist contention that recognition is a contingent reaction to direct experience by claiming that it is integral or transcendental to all experience. Some of the considerations they adduce to support this claim are the following: that children must build upon a subtle, innate form of linguistic apprehension in their learning of conventional language; that there must be a recognitive ordering of our most basic experiences of situations and movements in order to account for our ability to perform rapid behaviors; and that some form of subtle application of language in all experiences is necessary in order to account for our ability to remember them. Yeah I think I get the general gist of where they are going, i'm just not really sure where exactly they think Buddhist psychology falters answering the question of consciousness being conscious of itself..as it seems that recognition is being used as a proof for eternal existence of some sort, but I do not understand why recognition is proof of anything other than dependent origination "rhyming" for lack of a better term. Can someone else explain what I might be missing? Why is recognition of a thing in memory proof of a self? They also keep using words like "discrete" to describe moments within the context of dependent origination, which seems like an odd choice..as technically when one pans back and sees many things, nothing would be discrete. That is what i'm trying to do, I try to approach everything here I read and participate in in good faith, that's why i'm asking if someone else can explain it better, I might be missing something - in fact likely I am. Just going off what I see. I have yet to see an argument of self-affirmation that doesn't fall apart under scrutiny, even to a bumbler like me...but if someone makes one i'd be interested in seeing it. Nothing missing if we stay in the moment no matter how ordinary, how mundane. Facet 1 = dependent arising. names, descriptions, shapes, values, languages, etc. = the existence of rising and falling phenomena, etc. = the existence of beginning and ending processes. = all subjects and objects are created i.e. inherent existence is devoid. = the emptiness could be realised in various stages. Facet 2 = inherent existence. = the absence of beginning and ending processes. = the absence of conditional phenomena. = nothing has ever been created or changed. Zero (0) = intermediation = absence = emptiness but not nothingness. = a mathematical value intermediate between positive and negative values. = the absence of any or all units under consideration. ...(-2+2) + ... + (-133+133) ... = values of fluxes that are dependent arising. ... + (-2+2) + (-54+54) + .. = this arises, that arises. ... + (0) + ... = this ceases, that ceases = the stage of enlightenment. = all dependent arising are completely blown-off or extinguished. = a stage of perfect intermediation = a stage of absence = a complete realisation of emptiness. (....) = the Law of Karma = the universal law of balancing. -2+2 or -133+133 = the Law of Attraction. Once again, anything that inherently exists would not involve change and created objects cannot inherently exist since that would involve change. So which of the two aspects of nature inherently exists? I am the existential ground ... and ... the root of all things is nothing else but one Self ... I am the place in which all existing things abide. Oh all you ... beings ... Because I, the All-Creating Sovereign, have created you, you are My children and equal to Me. Because you are not second to Me, I am present in you ... Oh all you ... beings... if I were not, you would be non-existent. ... Because all things do not exist outside of Me, I firmly declare that I am all - the All-Creating One. I still haven't understood how Dharmakaya differs from Brahman. And this "self" word -- which the Advaitins expressly claim is not in any way different from Brahman, but only appears so to the unenlightened -- crops up in translations of our own texts. Replace it with, I don't know, "welf", and see if you still consider Advaita different. The above is the Kunjed Gyalpo. I really have to object to saying "these things are the same" based simply on small bits of quoted scripture etc. The exact wording isn't really the crux of things is it? The question is whether or not they are teaching the same thing, and whether or not (as much as we can tell) they might lead in the same direction. Incidental bits of text don't can't tell us that. As to whether or not "self" is important as a word, clearly much (though I know not all) Buddhist thought seemed to think the term "self" was worth avoiding for some very specific reasons - don't you think that's so? I'm no expert on Brahman, so correct me if I am wrong here, but I would say that while Dharmakaya is empty, pure potentiality, Brahman seems to me to be something actualised. Johnny Dangerous wrote: I really have to object to saying "these things are the same" based simply on small bits of quoted scripture etc. The exact wording isn't really the crux of things is it? The question is whether or not they are teaching the same thing, and whether or not (as much as we can tell) they might lead in the same direction. Incidental bits of text don't can't tell us that. You are correct. I don't mean to use these snippets to show that they must be the same. Instead, I use them to show that the appearance of certain words (immutable, eternal, blissful, Self, creator) in translations do not themselves say much about a teaching. Yes, I do think so! The reason is to not reinforce the notion that such a self actually exists. The main difference is that Advaita uses the word as a provisional teaching, which is ultimately thrown away, whereas Buddhism is more careful (but not entirely so -- see preceding quote) to avoid it right from the get-go. When the reflection of Atman falls on avidya (ignorance), atman becomes jīva — a living being with a body and senses. Each jiva feels as if he has his own, unique and distinct Atman, called jivatman. The concept of jiva is true only in the pragmatic level. In the transcendental level, only the one Atman, equal to Brahman, is true. In the tathagatagarbha sutric tradition, the Dharmakaya is taught by the Buddha to constitute the transcendental, blissful, eternal, and pure Self of the Buddha. futerko wrote: I'm no expert on Brahman, so correct me if I am wrong here, but I would say that while Dharmakaya is empty, pure potentiality, Brahman seems to me to be something actualised. I'm no expert on anything, so I'll avoid correcting you . Lord) itself are all untrue. Because all things spring from Brahman, they can never be said to be ultimately apart from or distinct from it. Including Atman (or the illusory "self"). So perhaps you've seen quotes which make it appear that Brahman is the actualization. In its very origin [tathata] is of itself endowed with sublime attributes. It manifests the highest wisdom which shines throughout the world, it has true knowledge and a mind resting simply in its own being. It is eternal, blissful, its own self-being and the purest simplicity; it is invigorating, immutable, free. Synonyms include dharmata and dharmakaya (and I think, dharmadhatu) -- although there are of course many subtleties there. This isn't meant to say that the two must be equal. Just that claiming obvious differences is hard, including the idea of a real "self" as distinct from the Ground of Being or whatever these are. Advaita Vedanta is a so-called substance ontology, an ontology "which holds that underlying the seeming change, variety, and multiplicity of existence there are unchanging and permanent entities (the so-called substances)". In contrast, Buddhism is a process ontology, according to which "there exists nothing permanent and unchanging, within or without man". Although it also adds that, "Kalupahana describes how in Buddhism there is also a current which favors substance ontology. Kalupahana sees Madhyamaka and Yogacara as reactions against developments toward substance ontology in Buddhism." Western scholars like N.V. Isaeva state that the Advaita and Buddhist philosophies, after being purified of accidental or historical accretions, can be safely regarded as different expressions of the same eternal absolute truth. 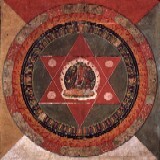 Ninian Smart, a historian of religion, noted that the differences between Shankara and Mahayana doctrines are largely a matter of emphasis and background, rather than essence.